Our world is filled with hazards and risks that have devastating effects on people, landscapes and economies. Such threats range from earthquakes to flooding, volcanoes to climate change, socio-political conflict to cyber security. We are at the forefront of research to help understand, predict, prevent and build resilience to these hazards and risks. In this way our research helps understand global threats, inform responses and improve lives. Research at Durham ranges from landslides, earthquakes, volcanoes, flooding, ice-sheet melting and water scarcity, to cyber security, financial risk and how we respond to an uncertain future. We work with a range of national and international partnerships to ensure that our research has practical applications and helps deliver benefits that improve lives and our environment. Our objective is simple – to use our unique expertise to make a positive difference in the world. 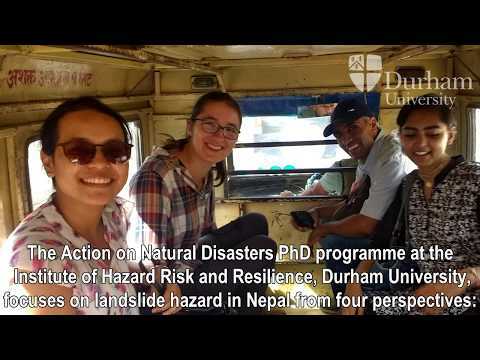 PhD students funded by the Action on Natural Disasters PhD programme travelled to Nepal in order to begin multidisciplinary research on landslides.